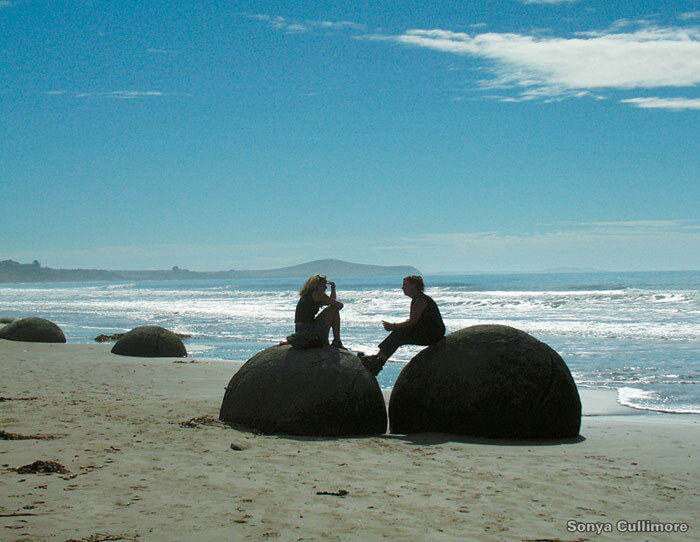 The Moeraki Boulders are a group of large spherical “stones” on Koekohe Beach near Moeraki on New Zealand’s Otago coast. These boulders are actually concretions that have been exposed through shoreline erosion from coastal cliffs. Even today, there are still boulders remaining in the mudstone that will, eventually, fall on to the beach as they come lose due to erosion! The boulders are one of the most fascinating and popular attractions on the South Island. They originally started forming in ancient sea floor sediments around 60 million years ago, and the largest boulders are estimated to have taken about 4 million years1 to get to their current size. Watch the video below for a short introduction and some fascinating facts about the Moeraki Boulders! Some of the boulders weigh several tonnes and the largest ones can be over 2 metres wide! 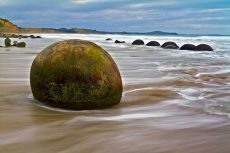 We showcase some of the very best photos of the Moeraki Boulders and the surrounding area on our Photos page. Maori legend tells that the boulders are remains of calabashes, kumaras and eel baskets that washed ashore after the legendary canoe, the Araiteuru was wrecked at nearby Shag Point (Matakaea). The Boulders are a very popular spot for photographers – and with good reason! Early morning and late afternoon are the prime times for photography, when brilliant soft sunlight is cast across the rocks; making for spectacular photographic opportunities. Other times, such as when storms are rolling in, provide an atmosphere and scene that can’t be matched anywhere else in New Zealand, or the world!